As required by the latest edition of NFPA Part 70 The National Electric Code. 3M Reflective Grounding Decals meet the requirements of Articles 700 & 702 for the identification of potential shock hazard. 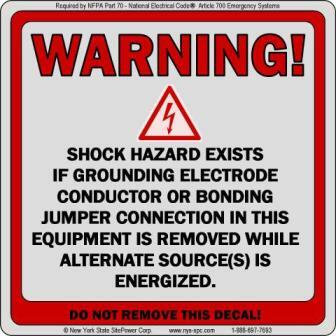 Where to use: This decal should be used specifically on generator installations. The decal should be placed at the service equipment on installations that are non separately derived (a solid, un-switched neutral in the transfer equipment). The majority of residential single-phase, and most light commercial applications fall into this category.